So the first bit of news on this for sometime but we have to wait till 2020 for. As long as there aren't more mind-control rodents, I'm on board. Dunno what guns it's using this time (potentially important to WoWs Harekaze), but dammit they're single mounts again. So it looks like that even if the movie were taken into account, it's still 100mm or bust. And seriously Yokosuka School are ungrateful pricks. In the anime the Harekaze crew identified the cause of the mind-control, find a cure, stop Musashi, and save a city. And they're still stuck on Harekaze, which I assume got refloated. Couldn't they have got a promotion to Takao, Akizuki, a Shimakaze with 100mm guns, or something? 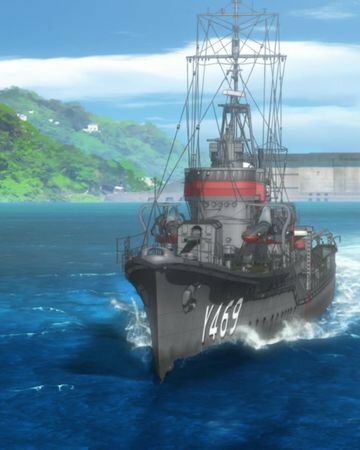 When the ova came out everyone seems to think Y469 had German 6in guns off graf. I decided to watch the 2 Haifuri OVAs, and man was I bored. A big problem with the TV series was that the crew was too big. There simply wasn't time within the confines of a 12 episode anime to give characters screen time. As such I didn't know who 80% of them were, and really did not care about their troubles. The Harekaze (both the old scrap, and new ship) appears for 5 minutes maybe.